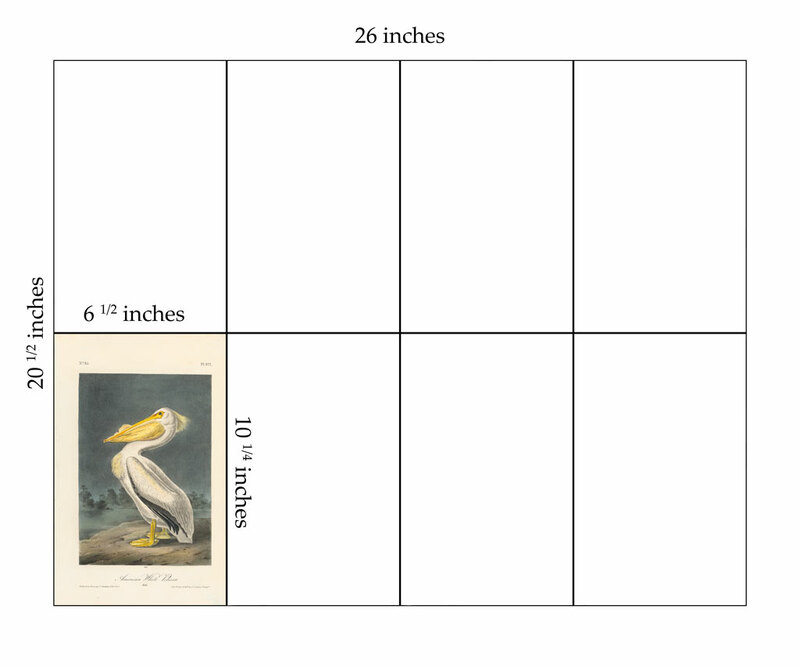 Audubon Paper Sizes | Joel Oppenheimer, Inc.
During his lifetime, John James Audubon created two great works on three different paper sizes. In the 19th century and earlier, traditional inch-based paper sizes had specific names that referred to the dimensions of the sheet (Click here for a reference to traditional inch-based paper sizes). The Birds of America Birds of America Havell edition, produced between 1826 and 1837 was printed on double elephant sized paper. The Viviparous Quadrupeds of North America hand-colored lithographs were printed on Imperial sized paper. A miniature edition of both The Birds of America and The Viviparous Quadrupeds of North America was printed on royal octavo sized paper. Audubon's Birds of America engravings produced by Robert Havell were of double elephant size. A sheet of paper in double elephant size would have measured 26 1/4 x 39 1/2 imperial inches. These dimensions would include the irregular, deckled edge of the natural sheet of paper. If a Havell engraving has been previously bound, it is likely the dimensions of the sheet will be slightly smaller and the deckled edge removed when the edge of the book block was chopped. All the paper for original Havell engravings was produced by the J. Whatman and Whatman Turkey Mill paper mills. A Havell engraving will bear a watermark that reads either J. Whatman and the year it was produced or Whatman Turkey Mill and the year the paper was produced at one of the four corners. The posthumous Bien edition prints produced between 1858 and 1860 were also of double elephant size; they bear no watermark. Audubon's Viviparous Quadrupeds of North America produced by J. T. Bowen & Co. were of imperial size. The typical full size for an Audubon Bowen edition lithograph is 22 x 28 inches. Imperial-sized Bowen edition hand colored lithographs bear no watermark. The octavo editions of both the Birds of America and the Viviparous Quadrupeds of North America were produced on a paper size called royal octavo. A traditional royal sheet of paper measures 20 1/2 x 26 inches. Each royal octavo sheet is 1/8 the size of a full royal sheet of paper and measure 6 1/4 x 10 1/2 inches. In other words, a royal octavo dimension is created by folding a royal sheet of paper in half three times. See the illustration below. Octavo edition prints from both the Birds of America and the Viviparous Quadrupeds of North America do not bear a watermark. Depiction of a royal sheet of paper divided into eight equal octavo-sized leaves.